Like an unrepentant Nazi, Paul Tibbets, captain of the `Enola Gay’, the specially equipped B-29 bomber that dropped the first atomic bomb on Hiroshimia, died at the age of 92. Obituaries appeared all over the world including a very good one in the Los Angeles Times (Nov. 2). Till the end, he was proud he did his job `well’. Appropriately, this week a delegation of two Hiroshima survivors spoke throughout the front range of Colorado about that day 62 years ago when their city was obliterated by the first nuclear bomb dropped specifically on human beings opening the nuclear age. Susumu Yoneda and Yukio Yohioda spoke to a startled audience, some of whom were in tears, detailing the grim horrors of August 6, 1945 in Hiroshima and how it was, that miraculously, they lived to tell the tale. The shadow of Hiroshima hung over Tibbets to the end. He worried that his passing would trigger anti-war demonstrations and requested that no funeral be held. For similar reasons he requested that no grave stone with his name on it be constructed and that his ashes be scattered over the North Atlantic Ocean. (Why the North Atlantic one must wonder). Tibbets was specially appointed to head the Hiroshima bombing mission, a mission for which the crew trained for 11 months before the attack. `My job in brief, was to wage atomic war’ he wrote in his book `The Flight of the Enola Gay’ (1989). Tibbets changed the airplane’s name to the `Enola Gay’ after his mother, a touching gesture indeed. The preparations included hundreds of mock-up runs over the Mohave Desert and the Salton Sea, the test bombs being full sized replicas of `the real thing’ (minus their nuclear warhead). According to the LA Times piece, on one run, the Enola Gay accidentally dropped an a-bomb replica too soon, narrowly missing Calipatria California. It dug a 10′ hole but failed to explode. Bulldozers were rushed in erase evidence of the accident. Then on August 6, 1945 at 17 seconds after 8:15 on a hot sunny morning, the Enola Gay dropped the 9,700 pound atomic weaponed named `Little Boy’ on Hiroshima. It exploded 1800 feet above the ground creating an inverted `V’ downward spray effect. The temperature at the core of the explosion was 50 million degrees (farhenheit). Three days later another bomb was dropped over the southern Japanese city of Nagasaki where the Spanish and Dutch used to trade with Japan for centuries. Unlike the Hiroshima bomb, the Nagasaki nuclear bomb was a plutonium based bomb. Both cities were leveled. The full casualty rate will never be known (if one takes into consideration those who died of radiation sickness and different forms of radiation- stimulated cancer, deaths that continue until the present), but certainly the figure is upwards of half a million and possibly far more than that. Far less known was that at the time, the US military possessed two more bombs which they were very anxious to drop. The Japanese surrender precluded dropping these on Japan. But shortly after the war they too were denotated in the Pacific in the presence of US naval personnel who were forced to do military maneuvres, some within a mile of the blasts, to see how the military could function under conditions of nuclear war (apparently they could not function very well). Many of these US military personnel, several thousand of them in all, were among the first nuclear guinea pigs. Like the Japanese victims, many of these Americans developed strange forms of cancer that killed them. They too are hibakshas. They formed an organization to lobby for special veterans benefits `Sundowners’, a branch of which existed in Colorado – at least until about a decade ago. The shadow of Hiroshima followed Tibbets all his life (as one might expect). He spent the next twenty years in the military but was purposely kept in low profile positions. In 1965 his appointment to the U.S. Military Supply Mission in India was cancelled when the India new media found out and ran stories calling him `the world’s greatest killer’. This was enough to have the State Department recall him to Washington and to shut down the entire mission. At least in certain more militarized and conservative circles, Tibbets made many public appearances. One of them was in 1976, when he outdid himself a bit. He piloted a restored B-29 that dropped a simulated, miniature atomic bomb at an air show in Texas, `complete with a little mushroom cloud’. Tibbets did not seem to understand why the Japanese might consider such a gesture offensive and called their angry reaction `ridiculous’, but it is reported that US government officials apologized. If the Holocaust is remembered – memorialized and institutionalized with the opening of the Holocaust Museum in Washington DC – the bombings of Hiroshima and Nagasaki have received a far more muted fate. For the 50th anniversary of the Hiroshima bombing, August, 1995, the Smithsonian Institute’s National Air and Space Museum displayed a part of the Enola Gay. They hoped to do a series of historical and educational forums about the Hiroshima and Nagasaki blasts. The proposed program, which had some national support, ran into a buzz saw of opposition though from veterans groups and members of Congress who thought it showed too much sympathy for the Japanese at the expense of the United States. First the exhibit was scaled down and then removed. Later, in 2003, the Enola Gay was put on display at the museum’s Seven F. Udvar-Hazy Center near Washington Dulles International Airport. My own concern is not so much about Mr. Tibbets, but that the memory of Hiroshima and Nagasaki is fading and as it does, the public is being once again worked to accept the possibility of using nukes, most specifically against Iran. 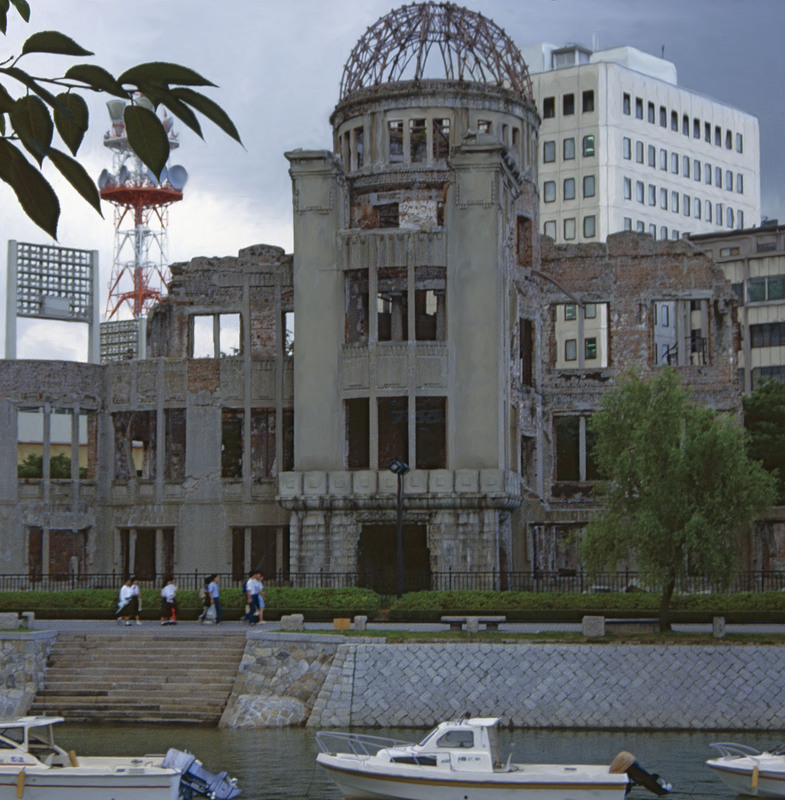 For a while there, it seemed the knowledge of the horror created in these two cities, helped hold back the nuclear weapons tide and stayed the hand of leaders of nuclear weapons powers from using the deadly things. Solid research suggests a very eerie picture, that on many occasions since Hiroshima and Nagasaki, `the nuclear option’ was seriously considered. Much has been written on how close we (we = the world) got unleashing nukes once again. In 1987 Michio Kaku and Daniel Axelrod published To Win a Nuclear War: The Pentagon’s Secret War Plans detailing many of the close brushes with nuclear war, many of them in the Middle East. Still worth the read. Tibbets was a proto type of what this country has produced and continues to produce – technically competent people with no understanding of history, and worse, no soul. And if there is an afterlife for him, I hope the spirits of the victims of Hiroshima and Nagasaki follow him wherever he might travel in the universe from here to eternity. ← Very Little Change in Congress Vis-avis Military Spending, War On Terrorism. Incredible that someone with so little understanding of history, so little understanding of the times and so much hatred of a man who did his job by serving his country is allowed to publish such a vile and shallow article. Shame. yes…for more of the same …see kristin ivensen’s Full Body Burden: Growing Up In the Shadow of Rocky Flats. whole communities living in denial, in a bubble while their neighborhoods fill with radiation. great book.